Anyone else notice the hyperspace effect from the third Star Wars: The Force Awakens trailer looked...a little familiar? Here's what it looks like compared with the warp effect from Star Trek Into Darkness and the Doctor Who time vortex. I like to believe they're going to rendezvous for the universe's most amazing timey wimey crossover event! Doctor Who just started series eight (“season eight” for the yanks) with a newly regenerated Twelfth Doctor played by Peter Capaldi. We’re a few episodes in and so far it’s been a bumpy ride. My favorite Doctor Who stories are about “the victory of intellect and romance over brute force and cynicism”, stuff that makes you think or gives you something to aspire to. I haven’t seen much of that yet. But this week’s episode, “Listen”, got very close. The Doctor did in seconds what I spend hours doing with my patients — teaching people that anxiety isn’t something to fear, it’s rocket fuel. No spoilers ahead, just psychological analysis. Let me tell you about scared. Your heart is beating so hard I can feel it through your hands. There’s so much blood and oxygen pumping through your brain it’s like rocket fuel. Right now you could run faster and you can fight harder. You can jump higher than ever in your life and you are so alert it’s like you can slow down time. What’s wrong with scared? Scared is a superpower! Your superpower! There is danger in this room. And guess what? It’s you. With this new way perspective, the boy is able to get through the situation, despite his terror. Some have called this the “we have nothing to fear but fear itself” Doctor Who episode. But that’s not entirely correct — The Doctor tells us we don’t have to fear fear itself, we need to feel it. As someone who’s spent their career studying anxiety and its treatment, I can tell you The Doctor is totally right. Emotions quickly communicate information. Sadness means a loss has occurred (your best friend moved away). Anger tells us we’ve been wronged (someone at work ate your leftovers without asking). Laughter lets people know that even though a social norm has been broken, things are okay (a friend walks, almost falls, but catches their balance right at the end). What about fear? It prepares us for danger. When we feel the presence of something scary, our bodies turn on the fight or flight response. Its job is to gets us ready to battle nearby dangers, support people who need help, or escape to safety as quickly as possible. That’s why your heart beats faster, you breathe more quickly, your muscles get tense, and you start to sweat. All of these changes are the “rocket fuel” The Doctor spoke of, the things that help us run faster, jump higher, and fight harder. Anxiety also warps your psychology. Your mind exaggerates details (making a scary dog look larger than it is), imagines the worst-case scenario (the dog is going to bite you and you’ll die), and forces you to ignore everything but the thing that scares you (you don’t see the dog is securely held by a leash). In the short term, all of this is a very good thing and protects us from predators (lions) and dangerous situations (walking across a rickety old bridge). A normal amount of stress also helps us get things done, whether it’s studying for a test or paying the bills. Stress, fear, and anxiety are our companions. Without them, our species wouldn’t have survived for very long. [Oxytocin] is a stress hormone. It's as much a part of your stress response as the adrenaline that makes your heart pound. And when oxytocin is released in the stress response, it is motivating you to seek support. Your biological stress response is nudging you to tell someone how you feel instead of bottling it up. When life is difficult, your stress response wants you to be surrounded by people who care about you. If stress, fear, and anxiety are normal and helpful parts of the human experience, than why are anxiety disorders one of the most common mental health problems impacting children, teenagers, and adults? Some people are more sensitive to anxiety. All those physical and mental changes we talked about, the stuff that comes along with the rocket fuel, those sensations are stronger in people who have a vulnerability to anxiety. Others have gone through difficult experiences — maybe they were bullied, saw a traumatic event where someone’s life was in danger, or were in a situation that went drastically wrong. There’s also the possibility that someone might not know what to do when they’re anxious and feel out of control when fight or flight is triggered. When anxiety limits what you can do in your life, or makes everyday activities painful, that’s when you’ve got an anxiety disorder. Most people with anxiety disorders cope by avoiding situations that cause them distress (like Tony Stark in Iron Man 3). But there’s no way to completely avoid anxiety, it’s a normal everyday human emotion. Avoiding situations increases anxiety sensitivity, making the problem a lot worse in the long-term. What’s the solution? Experience the anxiety and ride it out. This type of treatment is called exposure therapy. It’s based on the biological process of habituation, how humans get used to things that stay the same. Think about the last time you jumped in a pool. The water felt cold at first, right? But the longer you stayed in, the warmer the water felt. The actual temperature never changed but because you stayed in the situation your body got used to it. We use this same process in cognitive behavioral therapy to help people become comfortable with anxiety, accept anxious thoughts, and face anxious situations. It's the most effective treatment for anxiety disorders. 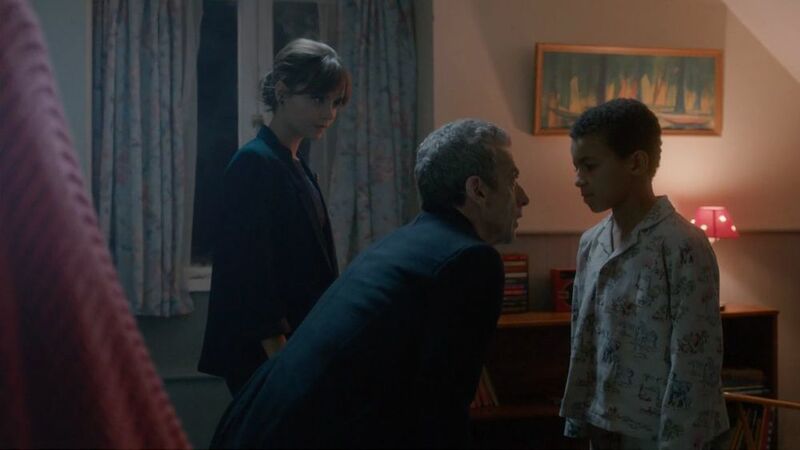 That’s why I love this week’s Doctor Who — it reminds us that everyone, including Time Lords, get anxious and that’s totally normal. In fact, it’s pretty cool and super helpful. For more on anxiety, cognitive behavioral therapy, and exposure treatment, watch my interview with Huffington Post Live. To hear more about Doctor Who Series 8 and the Twelfth Doctor, download episode 32 of the Super Fantastic Nerd Hour podcast. Doctor Who celebrates its 50th anniversary this Saturday, November 23rd. My geek flag is firmly planted in space science fiction. I became a psychologist because of Star Trek. Firefly helped me understand myself. And I use Battlestar Galactica to teach suicide prevention. When my mind wanders, it gravitates to the final frontier. Science fiction isn't just about space though. I've grown to love stories about dystopias, robotics, and time-travel too. That's why I was intrigued when BBC relaunched Doctor Who in 2005. I never saw the original Doctor Who series, but I knew it integrated many aspects of science fiction and was beloved around the world. I made it through 2 episodes of the new Doctor Who series before I quit. I didn’t understand the rules of the universe and was turned off by the cheap visual effects. I love British humor (I grew up watching Mr. Bean and Are you Being Served?) and I'm a huge fan of campy scifi (Galaxy Quest and The Fifth Element are amazing movies), but Doctor Who was just too weird for me. This was the moment I decided to stop watching Doctor Who. Even though I gave up on the Doctor, I couldn't quite escape him. My friends pestered me to give the show another chance, readers of this website kept asking me to write about the Doctor, and each time I spoke publicly about the psychology of science fiction someone in the audience ALWAYS brought him up. I read a few Wikipedia articles about Doctor Who, enough to drop references to sonic screwdrivers and the TARDIS. That got me by for a while. But when Geek Therapist Josué Cardona publicly called me out for not understanding Doctor Who on his podcast a couple of weeks ago, it become painfully clear to me that I wouldn't have any credibility as a science fiction psychologist until I understood what made Doctor Who so popular. The more I learned about Doctor Who, the more it reminded me of other scifi shows that I love. Illustration by J. K. Woodward for IDW Comics. I reached out to the Whovians in my life and asked them why they cared so much about the show, people like The Memoirist and The Superherologist. They told me about the Doctor's constant spirit of adventure, how he always did the right thing no matter the cost, and his imaginative intellect. That gave me a familiar context for the character – basically a mashup of Indiana Jones, Captain Kirk, and Sherlock Holmes, which sounded awesome! After my buddy, Bill, told me about BBC's tiny budget, I felt like a jerk for judging the show based on its special effects alone. What really hit me was how another friend, Anne, described her interpretation of regeneration – "like the Doctor, we can all shed dysfunctional parts of ourselves, keep our strengths, and build towards a better future." That's the same idea behind Star Trek! The more I listened to people who loved the Doctor, the more familiar he became. After publicly shaming me, Josué was kind enough to guide me through the best episodes of the show, like "Blink", "Father's Day", and "The 11th Hour". He gave me context and answered my questions. I initially committed to watching only 5 episodes, but now I've seen 17. Sure the order I saw episodes was a bit wibbly wobbly, and I’m still confused about the mythology, but I get the appeal now. As Craig Ferguson said, Doctor Who is about “the victory of intellect and romance over brute force and cynicism.” What’s not to love about that?!? For a kid who grew up being judged for looking different and having geeky interests, it was stupid for me to reject Doctor Who just because it was unfamiliar. But that’s how our psychology works – we like things we’re used to. The Doctor taught me that the only way to boldly go is by immersing ourselves in the unfamiliar and listening to people who see things differently than we do.